What began as a hobby for a young girl named Barbara Annalee Davis, grew into a family business-the business of doll making. A young adult in the 1930’s, Annalee created puppets and dolls, unaware that this hobby would become her life’s calling. She sold her dolls though various craft outlets in New Hampshire and Massachusetts. From the beginning, her dolls were in set positions, with the clothes sewed onto the doll. These were dolls for display, each with a story to tell. In 1941 Annalee married Charles “Chip” Thorndike, the son of a Boston physician. Chip had become a chicken farmer in Meredith. Chip and Annalee worked on the farm through the 1940s and 1950s, until poultry farming was no longer profitable in New Hampshire. Needing another way to make a living, Annalee returned to making dolls. She started in the kitchen of her Meredith farmhouse, helped by local women. Soon every corner of the house was taken over with doll parts. Thorndike not only employed several women in her home, she took work out to be completed in other women’s homes. 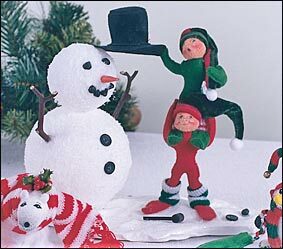 It was her husband Chip created clever wooden components for the dolls, including skis, ski poles, and little boats and it was also Chip who designed the wire frame that held the dolls in position. The doll business was incorporated in 1955 as Annalee Mobilitee Dolls and the company continued to grow introducing new lines and innovative ideas – in 1965 bunnies were added to the line, in 1965 we had the first appearance of the Annalee Mouse in publications, in 1978 the first Halloween Mouse appears, and in 1983 the Annalee Doll Society was founded. In 2002, Annalee Thorndike, artist and founder of the Annalee Mobilitee Dolls, inc. passed away at home after a short illness. 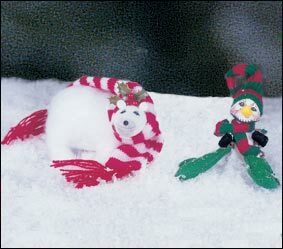 Today Annalee’s Felt and Wire Doll creations have become a US national tradition – given.as gifts for all occasions, Christmas, St. Valentine’s Day, Easter, St. Patricks Day, the Harvest Season, and Everyday. The original Annalee Doll Society was established in 1983 and in 2003 the Society transformed into the “Annalee Club”. The “Annalee Club” closed in 2005.